Dacorum students raise over £18,500 for local charities in a record-breaking Dragons’ Apprentice Challenge! Think Specialist Recruitment's Director, Chris Jones, supported a team from Adeyfield School taking part in the 2018/2019 Dragon's Apprentice Challenge. The challenge involves teams from schools across the Dacorum region taking an initial investment of £100 and aiming to raise a minimum of £1000 for their designated charity. Each school is paired with a business 'Dragon' to guide and support their fundraising efforts. Through running and attending various events, the Adeyfield Trinity team successfully raised over £1500 for Adeyfield Free Church. This fantastic total will buy an oven for the Church's new site at Maylands Plaza, allowing their volunteers to provide free meals to the vulnerable in Hemel Hempstead, along with the funding for many 'Messy Church' sessions for children with severe disabilities. 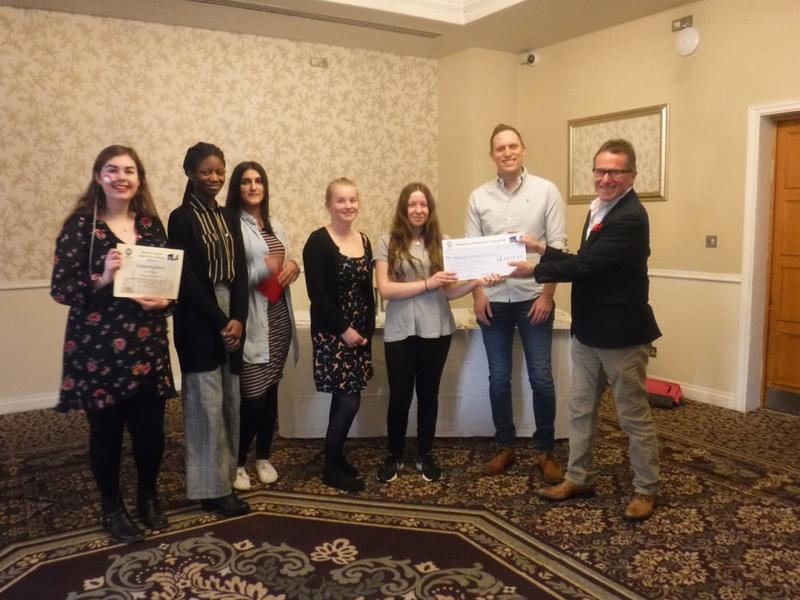 Winners of 2018/19 Challenge were announced after budding entrepreneurs pitched to SuperDragons at the Shendish Manor Hotel finals on Monday 1st April. Over £18,500 was raised across the 10 participating teams and the pupils all did a fantastic job presenting to a packed room at the event. Of the Adeyfield team's efforts, Chris said "The Adeyfield team should be massively proud at the commitment they have demonstrated in tackling the Dragon’s Apprentice Challenge. Along with juggling their school work they have spent a huge amount of time undertaking the challenge and the events that they ran. They have exclusively used their own resources and therefore every pound raised has been generated by their own work and efforts. Having not been phased by some initial teething issues, their dedication and hard work should be applauded and I am extremely impressed with what they have all achieved as a team!" Chris Jones, second from the right, with the team from Adeyfield School, presenting their cheque to Adeyfield Free Church.